It's a battle 65 million years in the making. Dinosaur's battle aliens in the aptly named first episode of digital comic book "Dinosaurs vs. Aliens," posted online at Yahoo Monday, July 23. From acclaimed filmmaker Barry Sonnenfeld (Men in Black films) and graphic novel superstar, Grant Morrison (Batman, All Star Superman), the so called "motion comic series" begins with a short narrated piece that sets the stage for the dramatic action: When aliens attack Earth, our planets only saviors are prehistoric beasts, which are more intelligent than humanity ever imagined. 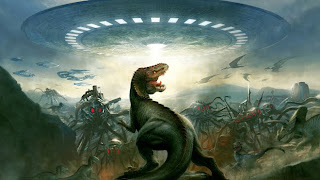 "Originally, I came up with the concept of, what would happen if aliens invaded earth 65 million years ago and the dinosaurs had to defend the Earth against these alien invaders," Sonnenfeld explained in an interview posted along with the episode. "Themes of apocalypse are very potent right now," writer Grant Morrison told Wired. "Dinosaurs dominated the planet for 165 million years. Human civilizations has been around for 6,000 years and we're already well on the way to rendering the planet uninhabitable for ourselves and other species. "Both dinosaurs and aliens can be seen as representatives of where we are as people right now," Morrison said. Dinosaurs vs. aliens isn't just a video series, it's also the comic book of the future. You can download an app that will offer the comic online from Google Play and install it on your tablet.